The global medical case management services market is likely to tread a growth path in the upcoming years. Medical case management services provide a host of advantages, of which reduced healthcare costs for patients is a prominent one. Medical case management services encompass a range of client-oriented services that link clients with healthcare systems, psychosocial support, reimbursement providers, and other services. Coordination and follow-ups with medical treatment are vital components of medical case management services. Majorly fuelling the medical case management services market are rising healthcare expenditures and medical costs control program and improved quality of care. Worldwide, private and public healthcare expenditure is escalating with growing population and prevalence of a host of diseases. Also, changing lifestyle account for up in demand for advanced healthcare products and services. Therefore, the adoption of medical case management services is on the rise. Medical case management services help to avoid unnecessary physician visits, hospital admissions, and medical complications by informed patient care and consistent monitoring of patient health. Not only this, fees incurred for medical case management services are also partially reimbursed by insurance providers. 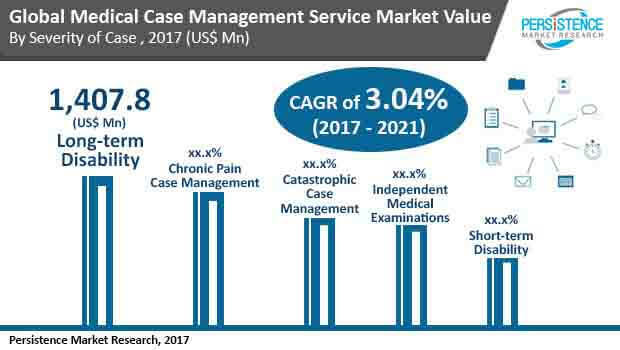 Considering the myriad advantages of medical case management services, the global medical case management services market is predicted to clock a CAGR of 3.04% for the forecast period between 2017 and 2021. At present, the healthcare industry is seeking reliable technologies for modern patient care. Medical case management services is an important component of the healthcare industry, which is driving demand for more advanced healthcare products and services. At present, the exponential growth of the world population is burdening healthcare resources and healthcare systems. The excessive burden on healthcare systems account for some kind of error or unintended drug side effects. In this scenario, medical case managers help prevent such errors by enabling easy access to patient history that provides details about drug reactions, post-surgery precautions, etc. Furthermore, technological advancements to enhance patient care is predicted to drive the growth of medical case management services market in the upcoming years. Increasing prevalence of chronic diseases such as heart disease, cancer, stroke, and obesity is also a key factor behind the growth of medical case management services market. This is because adoption of medical case management services especially in developed regions enable access to the most appropriate care. In addition, improvement in employment benefits, especially in developed countries is stoking demand for medical case management services to assure appropriate treatment in the event of workplace injuries. On the flip side, lack of awareness is a key factor challenging the growth of medical case management services market. As most vendors offering medical case management services are focused on developed regions, people in developing countries have very less awareness about these services. The dearth of professionals for medical case management services is also a hindrance to the growth of this market. Currently, around 50% of medical case managers handle more than 100 cases each in a month. Apart from this, high costs of medical case management is proving to be a bottleneck to the growth of medical case management services market. Low percentage of population having medical insurance in developing countries is limiting the demand for medical case management services in these regions. Among the various segments based on mode of service, web-based case management service holds prominence in this market. Hospital end-use segment is anticipated to continue to hold the leading market share over the forecast period. By severity of case, long-term disability segment is predicted to register a significant growth rate over the 2017-2021 forecast timeframe. Region-wise, North America is expected to remain at the fore in the medical case management services market in the near future. Europ Assistance - Global Corporate Solutions. EagleOne Case Management Solutions, Inc. Managed Medical Review Organization Inc.